Will Honda Have a Car in Nascar in 2019 or 2020? It has been announced that Dodge and Nissan will be coming to NASCAR in 2020. With this being the case, many diehard Honda fans are asking about the 2019 or 2020 season for Honda. It is crazy to think that Toyota, Ford, Chevy, Nissan and Dodge will all have cars in NASCAR but Honda will not have a single car. What makes this difficult to understand is the fact that so many people have souped up a Honda Civic or Honda Accord in the last 20 years. One would think all those eyeballs watching NASCAR would love to see a Honda speeding around the track. In the foreseeable future, it does not look as if there will be a Honda in NASCAR. If there was, what type of Honda would you prefer to see? An Accord? A Civic? The Civic Type R? We would love to hear your thoughts. In the meantime, do some research and see which drivers would be the best for a Honda car. There are some drivers that have stated the would only drive a Ford or a Chevy. Also understand that the owner of the car or the organization that owns the car and driver determine the manufacturer. RCR Racing will always be Chevy. This is just a fact. Maybe there will be some progressive NASCAR car owners or organizations that will make a push for Honda to make an appearance in NASCAR. Remember, in the early days of Toyota and the “Car of Tomorrow” there were just a handful of races in which the car made an appearance. Maybe we will see Honda racing cars in some other small known circuits. Have you seen Honda cars at your local race track? Inside, insulation is one of the first things you’ll notice thanks to the quiet ride, but as always, you can still turn it up to 11 with the available 10-speaker Premium Audio System. The next thing you’ll notice is the clean layout and easy-to-reach controls. The Honda Sensing suite of safety features gives you extra peace of mind with driver assist features that include Collision Mitigation System, Adaptive Cruise Control, Lane Keeping Assist, and much more. If you’re searching for a crossover that can haul all of your friends and their gear while still looking stylish on the road, then the Pilot is for you. Seat up to eight of your closest friends and family this summer and head out with plenty of power from the 3.5-liter V6. Interested in towing your small boat or trailer? The Pilot can help there, too, thanks to its 5,000-pound towing capacity. Everyone will be able to stay connected with the Pilot’s multiple USB ports, auxiliary jacks, 12-volt outlets, and HDMI port. Push-button start and Bluetooth capability come standard on every trim, and all but the base LX models get Android Auto, Apple CarPlay, SiriusXM Radio, and HondaLink. Of course, when you’re headed to your summer destination, the last thing you want to worry about is safety, so Honda has you covered with standard Brake Assist, Multi-Angle Rearview Camera, Vehicle Stability Assist, and more. There’s a reason the Honda Civic is so popular – it’s stylish, capable, and sporty, the perfect combination of features for your summer adventures. Choose between the sedan, coupe, or hatchback body styles and the 2.0-liter four-cylinder or the 1.5-liter turbocharged engine for a Civic that is uniquely you. MacPherson struts and a fully independent suspension give you the opportunity to really let loose on the open road this summer season. There is plenty of space for five and the 15.1-cubic feet of storage space in the trunk allows you to pack all of your beach gear or hiking supplies. Need a little more space? The 60/40 split rear seats can accommodate a variety of large items. Keep everyone happy with standard Apple CarPlay™ and Android Auto™, and if you want top-of-the-line safety features, the Honda Sensing suite of features gives you the confidence to go wherever the road leads you this summer. If you are waiting for a great deal on a new Honda, the Summer Spectacular Event could be the perfect time to buy. Honda should have aggressive discounts since their flagship Accord has not been performing as expected. If you are looking for a low price on a new Accord, Civic, CRV, or other honda model, contact your local Honda dealer and take advantage of these discounts! What is the Most Stolen Car in Pennsylvania? The most stolen car in Pennsylvania and throughout most of the United States is the 1997 Honda Accord. This is a very popular vehicle featuring valuable parts and lacking only one thing: security features. This makes it the prime vehicle for car thieves. These were followed up by various Impala, Carolla, Chevy Silverados, Cherokees and Malibu vehicles. If you’ve never been in a 1997 Accord, rest assured they are a great car. Moist come with the VTEC 2.2, a peppy little motor which is great on gas and good for 300,000 miles. Even in 2017, plenty of people are still buying these cars for fuel efficient cars to take to work and back home or for their teenagers. The tie rods break on them every 100,000 miles and they need a maintenance every 100k, but other than that, some O2 sensors and a battery now and again, you just fuel them up, change the oil once in a while and drive. Once jacked and stripped, thieves can get $100 just for an airbag on eBay! Try to avoid getting run over by one when the thief makes their get away- one lawyer in Philly points out that drivers of stolen cars are technically uninsured drivers. Of course, not all stolen Hondas are stripped, some are just thrown into a river. Chcek out this cray cray story about a couple who found their car 23 years later (and covered in clams). Do I Need A Driver’s License To Buy A Car In North Carolina? Interested in buying a car but don’t have a license? Many want to find a car dealer that sells to people without a driver’s license, and there are several that are skilled in these type of deals around the state. If a dealer tells you that they cannot sell to you without a license, it could be that they simply want to avoid the extra work. Typically deals without a driver’s license are more difficult for dealer’s to do and sometimes they avoid them. Hopefully you can find one that is happy to sell you a car! The 2018 Honda Civic has finally made its debut and car shoppers couldn’t be more thrilled. It’s sportier than ever before thanks to its shorter overhangs, new silhouette, and aggressive front fascia. If you opt for the entry-level LX model or mid-range EX, you can expect a 2.0 liter four-cylinder engine that can be paired with a six-speed manual or Continuously Variable Transmission. On the EX-T, EX-L, and Touring models, you’ll be able to choose the 1.5 liter direct injected turbo engine. Regardless of which model and engine you select, you’ll enjoy a powerful, fun-to-drive compact vehicle. Inside of the Civic, you’ll find a wide array of exciting standard and available features like automatic climate control, a multi-angle rearview camera, a power moonroof, remote engine start, fog lights, heated front seats, an 8-way power driver’s seat. In addition, the all-new Civic is equipped with the Honda Sensing suite of safety and driver-assistive technologies to ensure that you and your passengers are protected every time you’re on the road. The Honda Sensing suite includes the Collision Mitigation Braking System, Road Departure Mitigation System, Adaptive Cruise Control with Low-Speed Follow, and the Lane Keeping Assist System. If you’re interested in the cutting-edge Civic, it is in your best interest to head on over to Lejeune Honda Cars and trade in your current vehicle. By doing so, you’ll receive its full market value and be able to comfortably upgrade to the 2018 Civic. You may want to consider alternatives such as a Ford Fiesta or Ford Focus. You may be able to save a little more money by looking at some of the Ford and Chevy lines as they have been able to cut their prices to not only compete with Honda but beat them on prices. In 2017, Honda dealerships throughout the state of North Carolina are doing their best to get you on their lots or into their showrooms. Whether you are looking to buy a Civic or Accord, there are going to be ways to save money over the Labor Day weekend. Note that not every dealership is going to have the same sales and deals so we suggest you shop around. The first place you should start is Lejeune Honda. They always have some of the lowest prices. We are not sure why, but they are the dealership that always sticks out when it comes to these major holiday sales and deals. If you are looking to save on a new or used Honda there are plenty of places to do your research online. Sadly, you will likely find that your head starts spinning. The best thing you can do is actually pick up the phone and call a dealership to see what they are offering. If you don’t want the dealership to know your phone number you can always get a Google Voice number for one day and use it on your iPhone, Android or even through your laptop or tablet. This is a great way to make certain dealerships are not calling you back every single day. Labor Day weekend is a great weekend to buy a car as this is one of the last major sales before the new model vehicles come in. Most dealerships know they will be getting the 2018 models in the near future and they are looking to blowout the 2017 models. This means you could save quite a bit of money on a vehicle that is basically brand new. If there is going to be a body change on a Honda vehicle for 2018 and you are in the market to get a vehicle now, you are going to be able to save quite a bit of cash. Also note that most dealerships, Lejeune Honda included, are going to offer some very good financing offers if you are willing to lease. Even if you plan to purchase your vehicle, you should be able to get a low interest rate if your credit score is even decent. You do not have to have a perfect credit score to get a low interest rate on a new car purchase in September or October 2017. If you have any questions as it relates to buying a Honda Accord or Honda Civic on Labor Day weekend do not hesitate to comment below. Can I Negotiate to Drop a Dealer Admin Processing Fee? If you have been to a Honda dealership to buy a new or used car in the last few months, you have likely be quoted a price for a vehicle. Whether it is an Accord, Civic, Odyssey or CR-V you must understand that this is simply the price for the vehicle and not the price you are going to pay. When all is said and done, you are going to end up paying a lot more unless you negotiate other fees such as the dealer admin processing fee, title, tag and taxes. You may have a quote for a Honda Accord at $21,000 and find that you are being charged for $23,500 when you finish up the paperwork. How is this possible? Remember that the price of the car is simply the price of the car. This does not include all the added fees, warranties, insurance, etc. You will find the dealership will try to sell you GAP insurance, tire insurance, warranty packages and even extra oil changes. You never know what they will try to throw at you to get the price higher. Instead of falling for this, we suggest getting a walk away price in which you will walk out the door at a specific price. If you want to walk away at $21,000 you are going to have to negotiate that. If you are a great negotiator you will be able to get the dealer admin processing fee waived or dropped. Your goal should be to get this fee to $0. A dealer admin fee of $500 or more is beyond ridiculous. Sadly, most car buyers won’t even notice this because they are so happy to drive away in a brand new Honda Civic or Accord. Try not to get too excited about your new vehicle and recognize that you can save quite a bit of money by getting the Honda dealer to drop the admin fee. Look at the total amount you are going to have to pay and start negotiating from there. They will be fine with dropping the price of the car because they know they can get money out of you elsewhere including a bigger down payment or a higher interest rate on the car. Should a Dealer Admin Processing Fee Be $649? Recently, someone asked us about dealer admin fees. Please understand that these fees are quite variable. In fact, you can talk the dealer completely out of he fees if you are a good negotiator. In essence, these are just fees that are tacked on to the total cost of a vehicle. This is just a way for the dealership to make a little bit more money. If you want to save money on a vehicle purchase, negotiate a “walk out price” in which you see a price that you can walk out the door at. If you want a Honda Civic at $17,500 you need to tell them you want to walk out the door at that price. If you don’t you will find you end up paying close to $19,000 with the fees, taxes, tag and title. They will also try to sell you on GAP insurance, wheel insurance, warranty packages and some type of oil change package. When all is said and done, you may look at a price that is around $20,000. This is why it is so very effective to search around for the best Honda prices in your area. You can often negotiate a walking out price via email or over the telephone. If you give them your telephone number, they are going to call you all the time. We suggest doing all the business through email as you will then be able to make demands or simply walk away. If you find your local Honda dealership is trying to charge you $649 admin fees you should quickly talk them out of this. Not only are you going to have to pay these fees, but they will add it to the financing at whatever interest rate you are being charged. If you have bad credit and are being charged a 10% interest rate, you will pay the 10% on that $649 as well unless you pay it the day you buy the car. What admin processing fees have you seen when shopping for a new or used Honda? Should you buy a car on Craigslist or from a private owner to completely avoid these admin fees? Does Honda Have a First Time Car Buyers Discount Program? The answer is yes, but only at specific dealerships. You will need to scour your state to find out which Honda dealerships offer a first time car buyers discount program. You can do some quick Google searching or you can call up some of your local dealerships to see if they can knock off some money on the purchase or help with the financing. Financing is a huge part of the process for first time car buyers as most of them do not have the best credit or they haven’t built up credit. Getting a 720 credit score or better can take years and possibly decades for some recent college grads; especially if they have taken out high interest rate credit cards. Allow Honda to help you with the financing through their first time car buyers discount program. You will find there are a number of great ways to save money. If you can get a low interest rate and you are just starting your first real job, it is a good decision to take this low financing now. Many investment gurus state that you should take any financing under 5% you can get. The other extra money you earn can go towards your investments or paying off other high interest rate debts such as credit cards or high interest student loans. What state are you in? Do you know of any first time car buyers programs at Honda? Comment below with your location and we can help you find the best deal in your area. Honda dealerships often have a number of different discounts and specials. We all know they love their Memorial Day, July 4th and Labor Day specials. What about military discounts? There are quite a few Honda dealerships that are in the heart of “military towns” and cater to those in the Army, Navy, Coast Guard or Marines. So, how much money can you save with a Honda military discount and what is the best offer? It is important to note that almost all Honda dealerships cannot disclose their “military discount” on their website. At different times throughout the year they may state you get $1000 or $500 more on your trade in or you can get $750 off a new car, but those are changing on a monthly basis. In fact, they may change on a daily basis depending on what incentives Honda is offering them. Before you assume that your local dealership has the best military discount, it is best to pick up the phone and call. If you don’t do this, you are only guessing at how much money you can save. Also note that you may want to discuss other deals as well. You could get $500 over cost or could get the administration fee waived by doing some negotiating. Don’t let a Honda dealership or salesman tell you that they are getting you the best possible military deal only to find out they are hitting you with other fees and are pushing GAP insurance and other types of warranties. If you get hit with these types of fees, you might as well through the military discount out the window. If you are looking to save money on a new or used Honda Accord or Honda Civic purchase with a military discount, comment below and we can help you find what you are looking for. There is no reason to overpay for a Honda when there are so many dealerships throughout the United States. Josh Murphy on Do I Get a Military Discount at the Honda Dealership Near Camp Lejeune? Meghan Moran on What is in the Old Lejeune Lincoln Building on North Marine Boulevard? 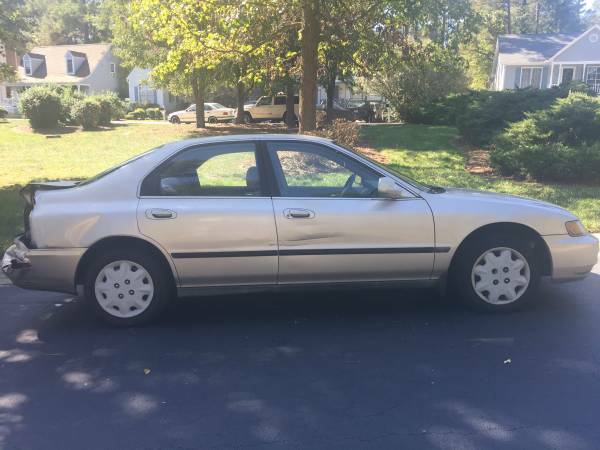 Kaitlyn McCord on Should I Buy a Used Honda on Craigslist in Jacksonville, NC?